When I shop for books for my kids I look for more than a book with a good message. Books with interesting story lines, creative characters and colorful illustrations capture my childrens’ attentions. The story needs to be simple and the message clear. My kids favorite stories are The Sneetches and Other Stories, The Giving Tree and Top Cat. Each book is simple, creative and has a clear message that kids can relate to. When I heard about two new children’s books that teach life lessons to kids I was eager to take a look at them myself. 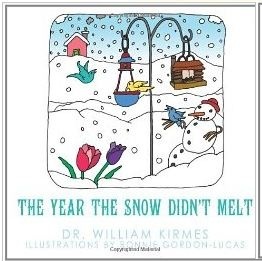 Dr. William Kirmes, a osteopathic physician recently published a children’s book that addresses the issue of climate change. Osteopathic doctors practice medicine based on the theory that disturbances in the musculoskeletal system affect other bodily parts, causing many disorders that can be corrected by various manipulative techniques in conjunction with conventional medical, surgical, pharmacological, and other therapeutic procedures. Why would an osteopathic doctor publish a children’s book about climate change? The book titled, “The Year The Snow Didn’t Melt,” is all about a winter that lasted a whole year due to a cloud produced by a volcano. I found the story rather depressing and uninteresting. After the first couple of pages my son who is four decided he didn’t like the book and he put it away. At the end of the story the cloud blows away and the warm weather returns. I am not a climatologist and neither is Dr. William Kirmes. So his theory that we are damaging the earth and it is leading to climate change is just that, a theory. I do not believe that climate change is as big of a problem as most liberal and progressives want us to believe. However, we should take care of the earth that God created by picking up litter and helping the animals who live here. But, my kids do not need to be scared by a book that says that the earth is changing and we could have a winter that lasts a whole year. The Year The Snow Didn’t Melt is depressing and pointless. 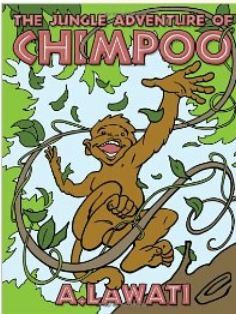 The Jungle Adventure of Chimpoo is another new children’s book that I was not impressed by. The author, A. Lawati attempts to teach kids the value of teamwork and loyalty through a little monkey’s adventure in the jungle to save his father from hunters. When little Chimpoo finds out that his father is trapped in a cage he sneaks out at night against his mother’s wishes to rescue his father. Along the way little Chimpoo meets and Owl who helps him bring his father home. I found the storyline boring and the pages had way too many words on them for young readers. If you are looking for a story about loyalty and teamwork read The Little Red Hen to your kids. The Little Red Hen is a classic folk tale that is simple, captivating and teaches kids the importance of working together for the common good. My children ages 4, 2 and 5 were not able to sit still long enough to listen to me read The Jungle Adventure of Chimpoo. But they love The Little Red Hen. If you are looking for interesting stories with positive messages for a Christmas gift for your kids do your homework first. Make sure you read reviews of new books first. A lot of the new children’s books are not worth the $10-$15 investment. Classic stories like Dr. Seuss and folk tales teach kids life lessons in a way that children can understand and enjoy. *Disclaimer I received a copy of The Jungle Adventures of Chimpoo and The Year the Snow Didn’t Melt from AuthorHouse in exchange for this review. All opinions are accurate and 100% mine.